Women overcoming barriers in the workplace is not a new phenomenon and certainly has been in the forefront of recent news. As we continue to fight for equal pay, diversity and against stereotypical gender norms in any work environment, it is especially prominent in a predominately male profession. Law enforcement continues to be one of these environments. According to the National Law Enforcement Officers Memorial Fund, females account for only 12 percent of Law Enforcement Officers (LEO). Some blame recruiting, or disadvantages such as the physical agility test, or height/weight requirements. During the early 1900s, women (who were often police officer’s wives) served as matrons overseeing female prisoners. Their roles also included: desk work, meter maids and counselling wayward women and children. Essentially, their primary focus were only women and children. We began to see a paradigm shift in 1910 with Alice Stebbins Wells who was noted as being the first policewoman. Although there is some debate as to who really holds this title, Stebbins was certainly a modern-day game changer. She was the founder of Association Women of Police (AWP) which is now known as the International Association of Women Police (IAWP). Marie Owens was the first woman of the Chicago Police Department. According to IAWP, women were not assigned to patrol during this time. As we fast forward to the 60s, women had few opportunities to climb up the ladder of success. The Civil Rights Act of 1964 (specifically Title VII) created some obstacles for employers to discriminate against women. The Act was amended in 1991. This is not to say that challenges ended because of this Act. Oh no, women in law enforcement continue to face new challenges as well as the old of their predecessors. 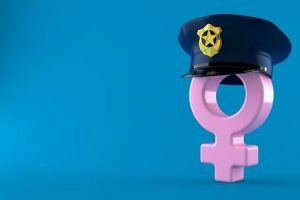 Most of us have heard of “breaking the glass ceiling;” however, in law enforcement there is a term referred to as the “brass ceiling.” The meanings are similar; however, breaking the brass ceiling suggest there is an upward barrier to achieving rank. Women in LE (Law Enforcement) continue to redefine what it means to be a woman in the profession. In 1992, Elizabeth (Betsy) Watson became the first woman to govern the City of Houston Texas. Watson encountered her fair share of gender bias. When she joined the Houston Police Department she was given a dress pattern and instructed to sew her own uniform. In 2017, North Carolina reported having six female police chiefs, all of whom were women of color. Women in the work place strive for the same acceptance, promotions, accolades, fairness and a financial independence as well as their male counterparts; however, at the core as people, we all desire respect. We desire respect on an individual level as well as a professional level. The song Respect by the late great Queen of Soul Aretha Franklin, simply stated in a verse she wanted her proper’s when she got home. The notion that women are incapable of excelling in top leadership positions rears its ugly head all across the world. June of 2018, Qatar Airline executive Akbar al Baker stated his job couldn’t be done by a woman. He was quoted in a meeting saying, “Of course it has to be led by a man because it is a very challenging position”. According to the article, it was unclear whether his remarks were a joke; however, he went on to acknowledge that Qatar Airways embraces diversity and was the first carrier in the region to promote a woman pilot. Mary Kay Ash, founder of Mary Kay Cosmetics, was another game changer. She began her journey because she was tired of being under paid and training men who would later move up the corporate ladder while she stayed in the shadows. It’s not surprising that women in law enforcement account for a very small percentage of top leadership positions. So, how is this being changed? It’s rapidly changing by examples in all facets of the work place. Women are beginning to stand up and take charge. Not only are female officers setting the ground work for women in general in the profession, we are crossing racial, ethnic, religious and sexual orientation identification boundaries. The future is bright and full of future qualified female executive, chiefs and CEO’s.